Welcome to my stop on the inspiration blog hop, for the challenge! I’ve been using my EZ Dresden Quilting Ruler for three years or so. It is so nifty to have, when I’m inspired to make a Dresden! 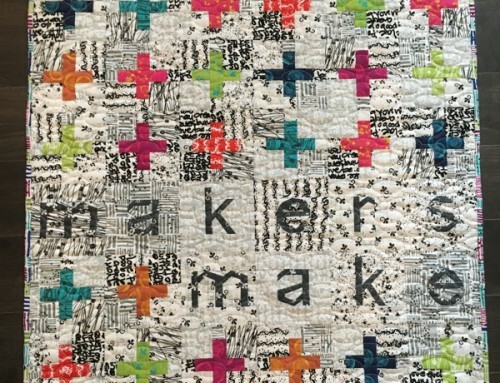 The Salt Lake Modern Quilt Guild has partnered with EZ Quilting to create a fantastic quilt challenge to celebrate Darlene Zimmerman’s 20th Anniversary with EZ Quilting. 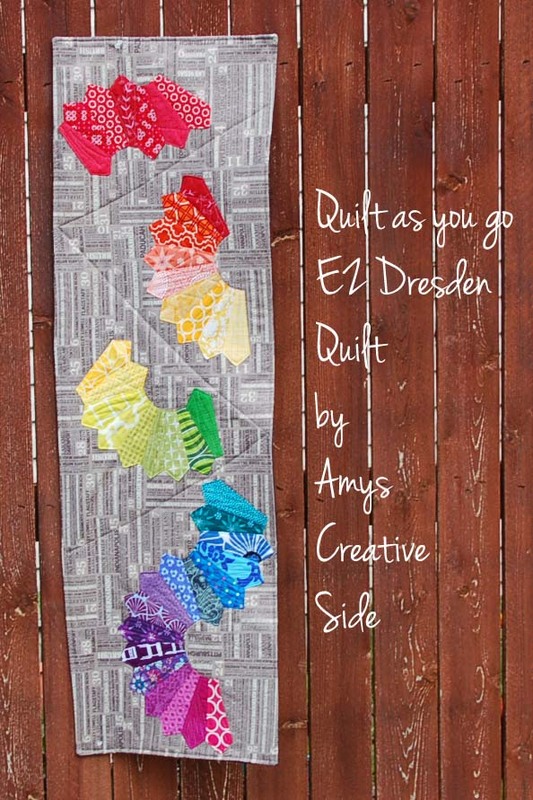 We’ve got an exciting 14-day blog hop planned, multiple chances to win the EZ Dresden Quilting Ruler for working on your quilts, plus loads of fabulous prizes. Follow along June 2-14 with some of our favorite bloggers (some you may know, and others who might be new to you). Plus meet some of our talented guild members along the way. Work like the dickens from June 15-August 31 on your project. Wait patiently while the judges do their thing, then see who wins on September 17. Winning quilts get tons of prizes (with random drawings too) PLUS they get to have their quilts displayed in the EZ Quilting/Simplicity booth at the 2012 Fall Quilt Market. How awesome is that?! Measuring 13″ x 40″ it is the right size to be a table runner, but part of me wants to put it on the wall as art/inspiration. Just in case you want to try your hand at making something similar, here’s how I got started! 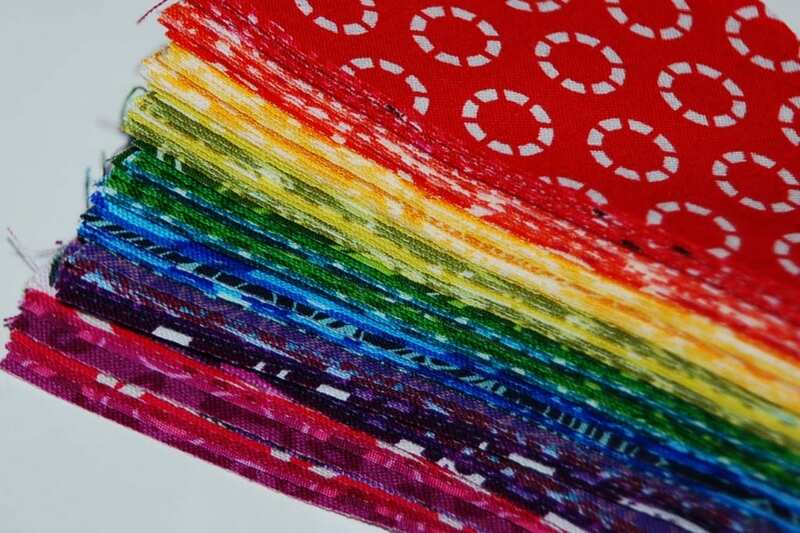 I cut a pile of 5″ wedges from the Color Wheel Charm Swap we did at Sewing Summit last year. I sewed the larger end as usual, and pressed a 1/4″ up from the bottom. And I spray basted background fabric to my batting. Pins work too, I happened to have the spray on hand! 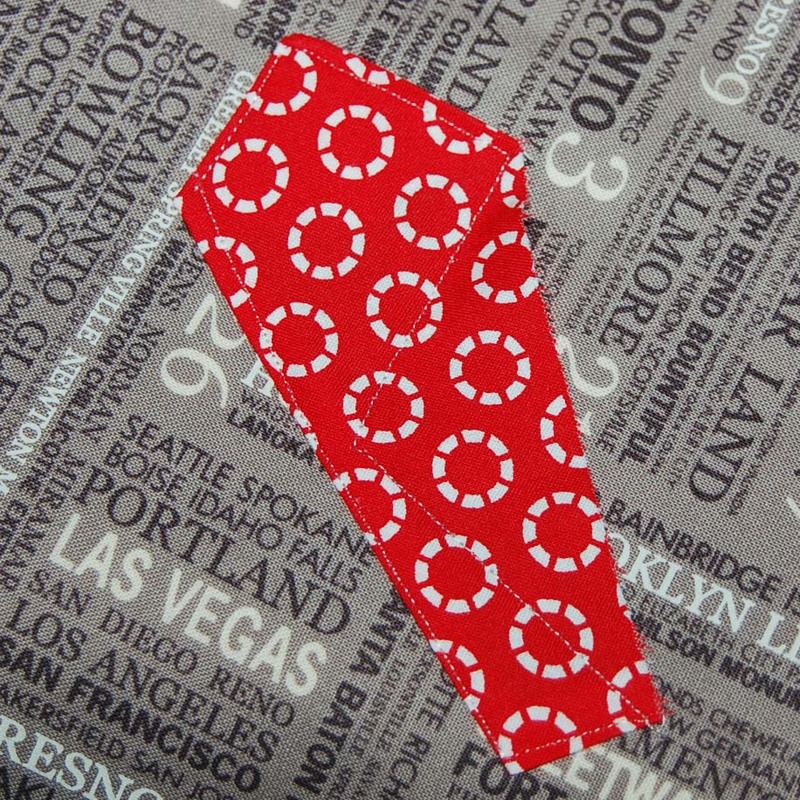 Decide where you want to begin, right sides together, sew down one side using a 1/4″ seam allowance. Flip it over the seam allowance, and stitch down the same length, and fill in the plate as you like. Mine are all a little different! Offset the pieces so that it lines up, when you flip it over the seam allowance. When you need to stop a group, pin or press under a 1/4″ seam allowance and quilt it into place. See how varied the quilting is? It’s a fun way to try a little something new. If you have a walking foot, use it, if not a normal foot will work too, just be sure to help the layers under the needle. I finished it with the no binding, I layered a piece of backing fabric, right sides together with the top, sewed 1/4″ around, leaving a 6″ gap to turn it right side out with. After pressing it out, I top-stitched around the perimeter to close the opening. And I added a few more straight lines, at that point to the backing fabric, to make sure it all stays put! What do you think, is that doable for you? **Disclaimer: I didn’t make a full circle with this technique, I’m not sure what the outcome may be, as things tend to shift while sewing. If you want to make full circles, experiment before starting your project. There’s a ton of great prizes for those who participate in the challenge! Check out all the great sponsors, and their offerings here, and follow along with the hop, for lots more inspiration! I almost forgot! If you would like to win an EZ Dresden Ruler, leave me a comment. Just let me know what you are working on this week! The winners (I have 2 rulers to giveaway!) will be announce on Monday, June 11, 2012. What a great tutorial!! Very ‘creative’, not to mention, inspirational. This week I am working on three different projects. Of course, I’ve started my Dresden Plate Challenge quilt; I’m hand-quilting a Raggedy Ann baby quilt inspired by Kaaren at The Painted Quilt, and I am adding the last row of blocks and sashing on a signature quilt for my little quilt group. Busy, busy, busy!! 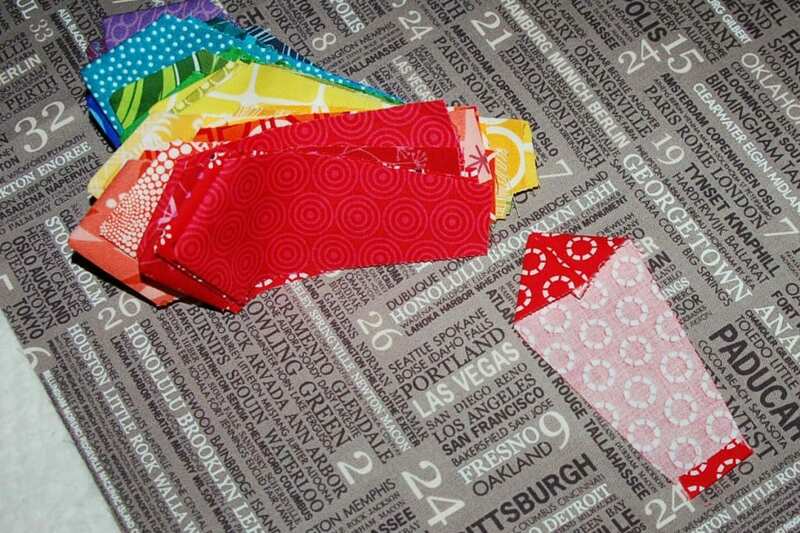 I’m sewing the binding on a bull’s eye quilt and putting the borders on a jelly roll baby quilt. Thanks for the giveaway! I’ve always wanted to try a Dresden myself. And the rainbow colors are just up my alley. I do love your runner/wall hanging version. This week I’m hurrying to finish 3 teacher end of year quilts. I’ve been working on them way too long and will be so happy to have them done and delivered. I really like your Dresden Wall Hanging, and your use of the color wheel too. I love how the partial wheels twist and turn along the runner – great movement. I also like the background fabric that you used. 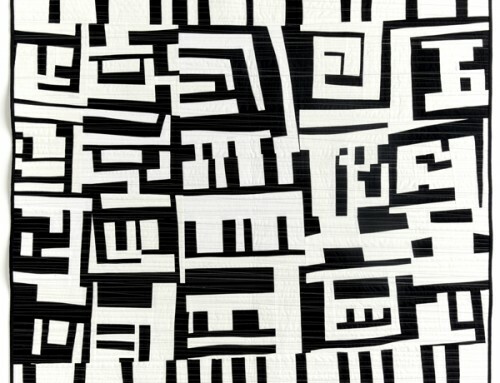 Can you please tell me who designed it, and is it a current fabric that would still be available? I love your wall hanging! I’m working on a quilt and a organizer. I love your take on the Dresden – its interesting to see something different. I am working on a pencil mini quilt/wall hanging as a teacher appreciation gift and I think I will leave off the binding and finish off like you have. So thanks for the idea. Your Dresden piece is so creative, Amy! Unfortunately, I don’t have time for any quilting or handwork this week. :( I have a lot of paperwork and computer catch up to get done. 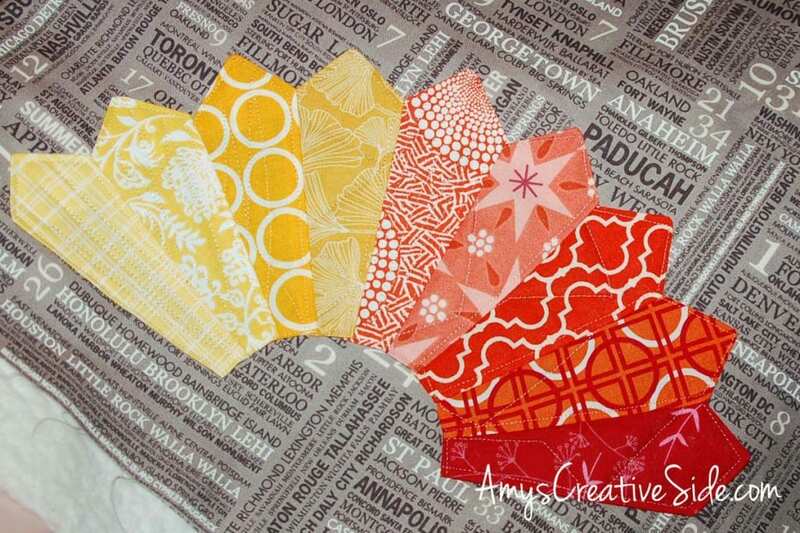 This week I am wrapping up piecing a modern patchwork top, cutting out another baby quilt with a new ruler I picked up while in Lancaster, and designing the pattern for one of my QuiltCon blocks. All this and starting to remodel my kitchen. Who needs to sleep? Thanks for posting your tutorial. I dream of Dresdens! This week I’ve been playing catch up on things I let slide the past few weeks. Yesteday it was clearing off my cutting table and putting fabrics into their new home that have been sitting in a pile since I got them over the past few months. And finding my cutting table was the biggest thing because I have a few quilt alongs I wanted to do which started this week to see how well I could do. By suppertime last night since I started very late in the afternoon, I was able to see my table so that’s the best part. I’ve only a few more things to get put away and I can get started on something. YAY! I love your Dresden and how it’s a quilt as you go. Those are always fun to do. Thank you for showing us what you came up with. I always love reading your blog to see what new things you’ve come up wtih. Nice tutorial. I’m ready to start my Dresden. I don’t have the ruler and would love to win one. Thanks for the opportunity. 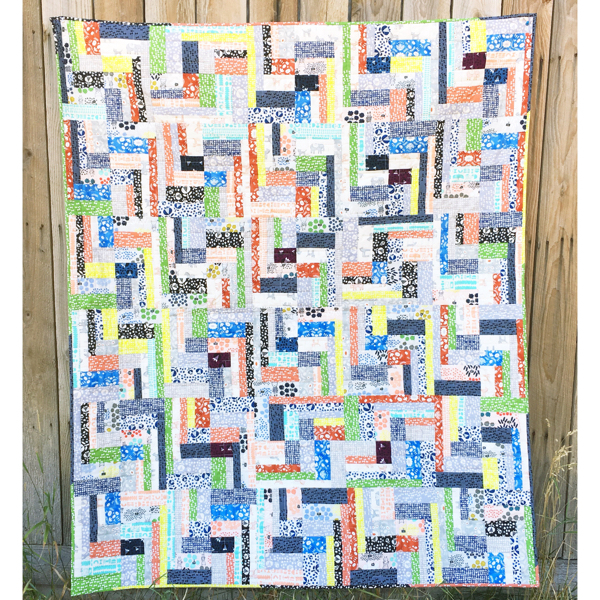 Your quilt is fantastic….makes me think of pencil shavings from a really cool colored pencil as they fall to the table. Love your bright colors! This week I’m trying to finish two quilt tops, add a few more hexes to my candied hexagons, and, most importantly, spend some sewing time with my kiddos. 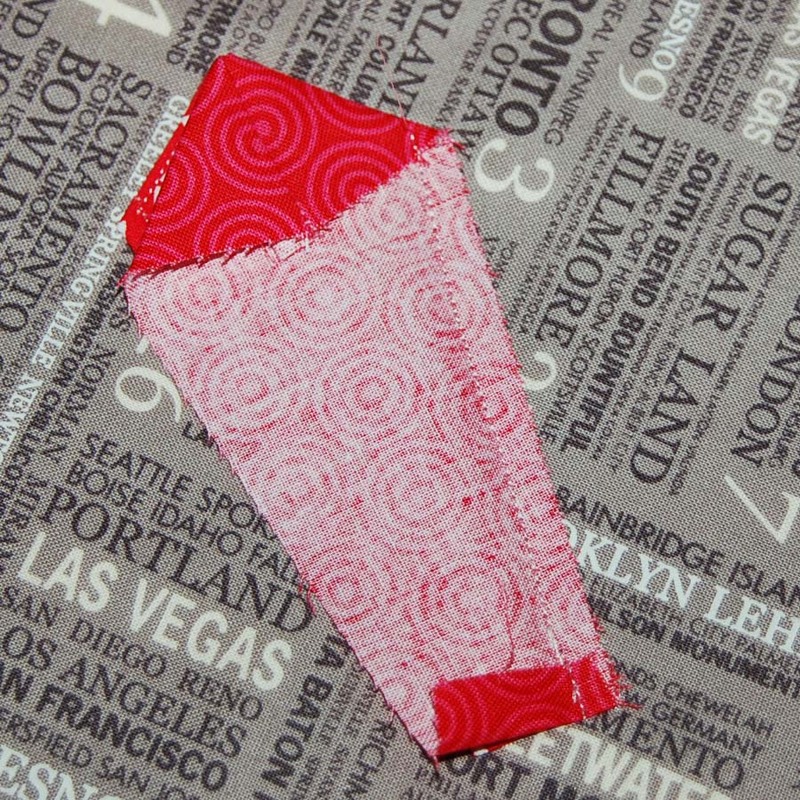 I’d love to win this ruler, especially after falling in love with the darling tea time dresden quilt at Moda bake shop. Thanks for the giveaway!! I am trying to get a wall hanging finished for my youngest daughter. It is being hand quilted and my daughter, who lives with us, is spending the next 2 weeks at her brother’s house looking after his 2 cats while he is on vacation. I want this to be a total surprise for her birthday. Thanks for the chance to win! Hope Mr. Random picks me! Thanks for the giveaway! I’m just finishing up a SWOON quilt and starting a Simon’s Landing kit from my LQS. I’m working on a quilt for my brother’s graduation! I am working on finishing up some UFO’s that I have far too many of! 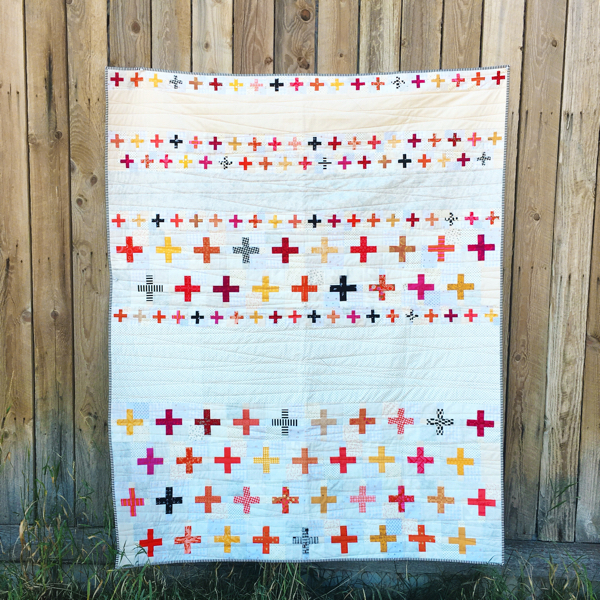 This week I’m working on a new quilt tutorial and my Farmer’s Wife blocks! Thanks for sharing your technique. It looks quick and easy…just the way we like it. This week I’m working on some wonky 9 patches. I have never done anything dresden, haven’t really been a fan of the full plates, but this?…I LOVE! Imjust loving all the wonderful ideas being shared. I definitely want to try using this ruler. Meanwhile, this week, in between bathroom remodel I’m making a new shower curtain using Sparkle Punch from Elizabeth Hartman. All my wonky stars are lavenders and grays. This looks so fun. I am working on a giant star quilt in the color wheel/ color scheme… Christmas Gift for a special 19 yr old, my daughter!! I am working on the quilting of a wedding gift for my niece this week. Love your Dresden and thanks for the chance to win! I’m working on a couple of cathedral window pincushions, and Elizabeth Hartman’s mod sampler quilt. And trying to get my dining room table/sewing area organized ;) I love your table runner and I can’t wait to try my hand at my own Dresden plate project! this weekend? making notebook covers for my dd’s preschool teachers. I’m working on a quilt to cover the glass oval in our front door. Hmmm…the question should be what am I NOT working on this week. Trying to make my way through 2 Baby Quilts, a new Pattern Quilt, and 2 Wedding Quilts. They won’t all get done this week…I’m not nuts; but at least I’m making headway. Love that! I think it should be an art piece. I haven’t made a Dresden in years, but I might if I had a ruler….hint hint. I am working on shorts for my grandson this week and hopefully the last one of my swoon blocks. Your table runner is just lovely! I am working on de-constructing this week. Not a sewing project, but tearing out our old deck and re-purposing the good bits as a path out to our workshop. Thanks for the chance of winning. Right now I’m working on a throw to give to my MIL for her birthday. Her birthday is on Sunday so I’ve got to work fast! Unfortunately, there are no sewing projects on my schedule for this week. I’m getting ready for a camping trip! Thanks for the great giveaway! I’m working on some kitchen accessories including a wall hanging. This week I am working on a Schnibble’s wall hanging and organizing my sewing area! Thanks for the chance to win your giveaway. I am working on a wonky strip pieced block quilt for my son, a kindle cover for my daughter and I may make a clutch purse for my mother’s birthday. Trying to finish a baby quilt, but I am dying to do something with the dresden ruler but can’t find one up here in Canada,at least around where I live. I love what you did very creative. This is a genius technique Amy! Clever, clever gal! I love what you did with the ruler! I’m going to have to do something like that. It makes me think of pencil shavings. 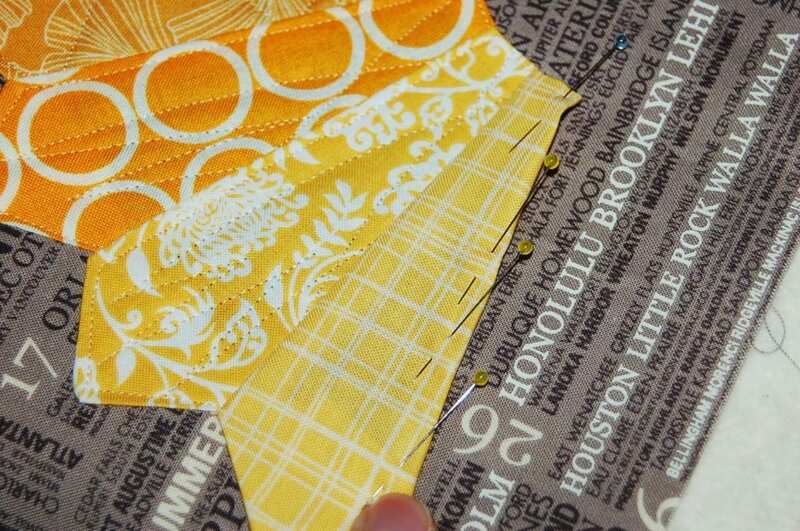 I’d love to use some kona solids and make a pencil shavings quilt. Thanks for the giveaway, I would love to try using that ruler. This week I am working on sewing a mini of my dog. This week I hope to get my costume hats finished and delivered. Then I have a custom tablecloth promised. Saturday if I’ve been good, I’ll go to Panquitch to their Quilt Walk. Love what you made. Thanks. No sewing for me this week. I’m working on painting and getting my daughter’s big girl room ready for her. Like! I could make a template right? I like the grey background and bold colors on top! Mine would be floral on top! I might get to a skirt for me! thanks for the giveaways. I am working on cleaning up my sewing room so I can tackle a couple of summer projects. I am actually working on a jersey knit dress right now. 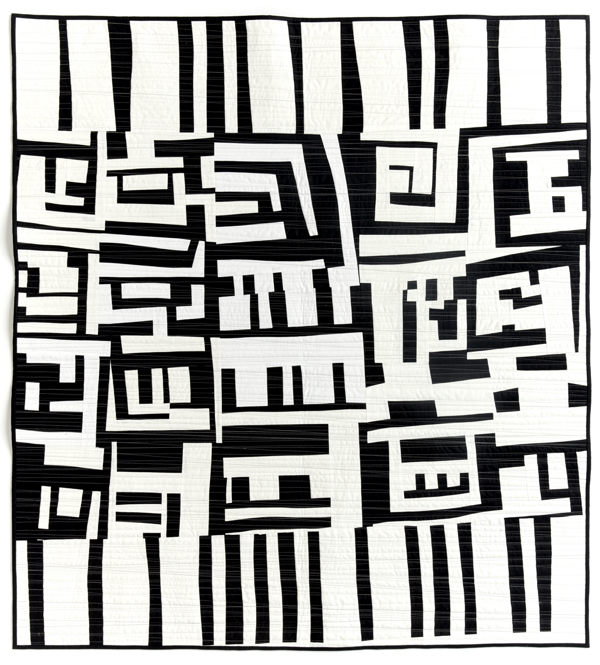 I want to make a modern dresden quilt. i’m quilting a baby blanket for my soon to be dggs and making him a few other things while i wait for the last clue for a mystery quilt that is happening on facebook and gathering fabric for a black and white quilt, my next project. i like your table runner and how you’ve worked it! great ideas there! What an awesome wallhanging or tablerunner. Whatever it’s called I love it! I can’t wait to try this ruler. I made some Dresden blocks years ago but it was with a template and never completed. I have several projects I’m working on. I’m doing redwork blocks for a Christmas quilt, hand piecing mini blocks for a wallhanging and working on a Civil War QAL with some online friends. Oh and I’m making two zippered pouches for a charity I heard about online. I am taking a break from fun things, and I’m looking for a new job. Thanks for the chance to win! I don’t have a ruler like this, so when I get back to fun-time, I’d like to try one out. Your dresden plate piece is lovely! I am working on a list of tops that need quilted and have been sitting around for awhile. Next in line is an I Spy quilt. 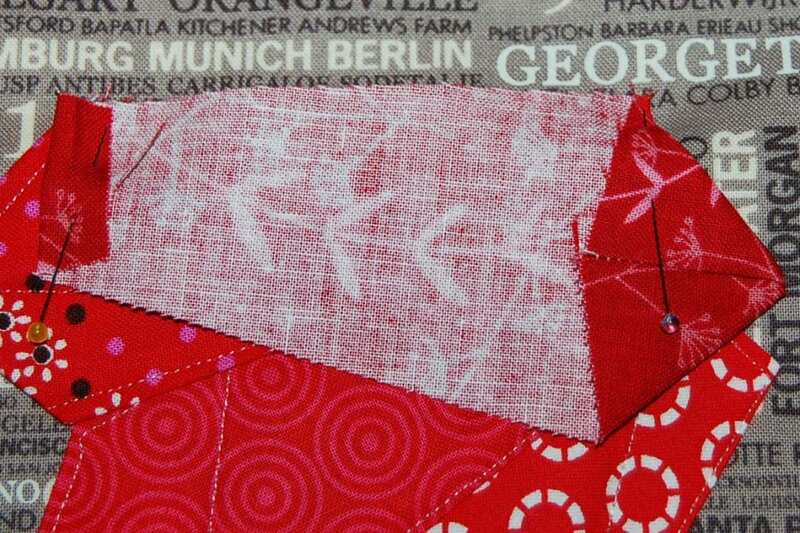 Thanks for the giveaway.This week I`m playibg with some dear jane blocks and cutting fabrics for a new projects! Amy, I love this — I vote that you hang it on the wall! I am planning a quilt for my son…who knew how difficult it would be to start it? Great idea! I’m going to have to try this project this weekend – never mind the UFO’s sitting by the sewing cabinet. This one looks like FUN! Thanks for sharing your beautiful runner, Amy! I love the rainbow of colours. I can’t believe I stubled on this challenge because I am actually working on a Dresden plate quilt. I got inspired from a pillow swap that I joined and received a Dresden plate pillow. I’m jumping ina a little late, but I can’t wait to see all the other blogs. I am finishing 2 split Bnto quilts. I love this pattern. So easy and so much fun to see the results. 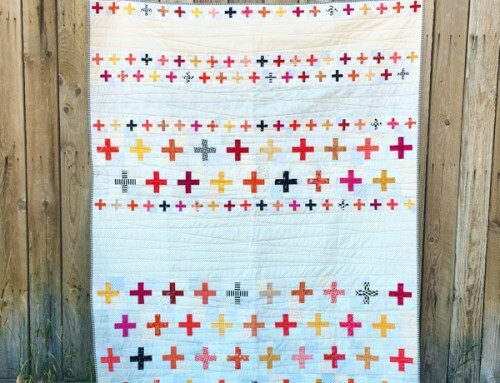 fabulous idea…..someone gave me a bunch of plates for put on a charity quilt …your tutorial has given me some ideas! thank you for this easy to follow tutorial! Ive done one QAYG project and it was very satisfying. 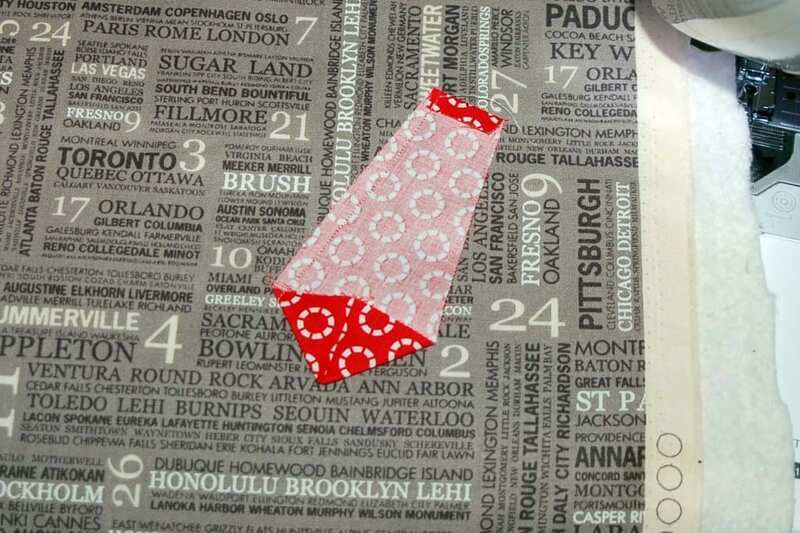 This is a fun twist as you are quilting onto the top fabric so you can turn it once you bring in the backing. I am inspired to try. i hope i win the dresden ruler as I’d lover to try this idea! I am working on a quilt for my daughter-in-law made with Texas fabric print. She is a native of Texas. this is fantastic :) I am working on an online quilt along, adding a round, to a round robin, and making a quilt for my grand daughter. Awesome! I have never tried this pattern but love the blog hop and so now I am headed out to see what everyone is making, thanks!! Love this new version of an old favorite. Thanks for the inspiration. What a great tutorial. 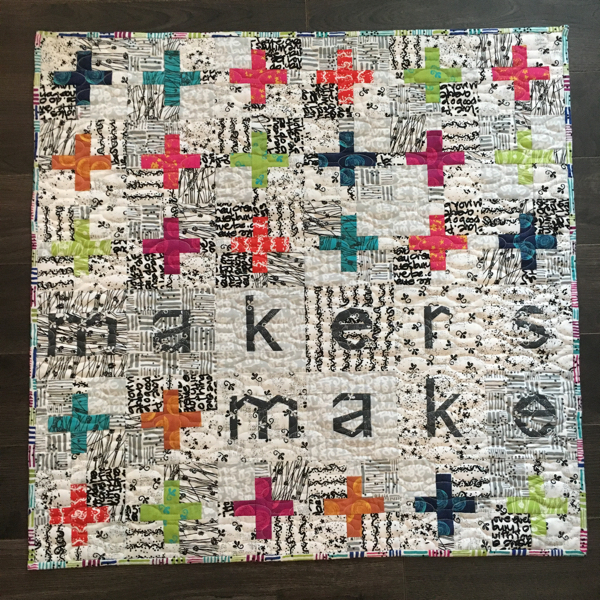 I love the quilt as you go method using the ruler. I have only tried to make a dresden plate once…and with paper templates. Not such a nice result, believe me. I would love to try again with the ruler!!!! Very cool! I never thought to use this shape this way. Another way to quilt as you go is great too it opens up a lot of possibilities. Thanks for sharing. I love your take on the dresden plate!! Sew modern and fun!! 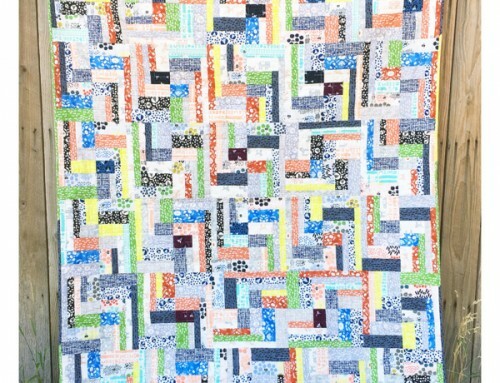 I’ve been working on a baby quilt with the top border that has some embroidery on it (I got the pattern here: http://nanacompany.typepad.com/nanacompany/2012/03/three-sleepy-time-doll-quilts.html#comment-6a0147e2980363970b016763d33181970b) I just got the embroidery done last night, so it’s on to the borders and then quilt it! I’m working on a fun little purse at the moment and trying to finish up a little tunic dress for my daughter. What a wonderful quilt you made. I love Dresden Quilts and I added some in a wall hanging I’m making for a exhibition. Well I don’t have the Ruler but would surely love to have one. (Actually I have never seen one). Working on my son’s rooster quilt. I am working on a quilt for my gradson. Wonderfully done! You ‘Dresden People’ are so creative! The tutorial is totally do-able! Awesome! I love your technique. Thank you for sharing the tutorial and participating in the blog hop. Am working on machine quilting some UFO’s from WKW (who knows when). It’s a mish mash week with the schedule, so working on some mish mash UFO’s totally fits our week’s theme :) If it gets too hot this week, I’ll work on smaller UFO’s so they aren’t as heavy and hot. I will be finishing up my patchwork prism quilt! hi! Thanks for a chance to win this ruler–it would be great! Hey, any chance you know of a pattern location or a tutorial for a Dresden plate with a cut-out window in the middle circle ? Or a Dresden plate with a sun or starburst inside the plate ? I’m still working on piecing my blocks for my king-sized Patriotic-colored sampler…I’ve got about 18 to go. I got my Mother’s Delight Compass block done tonight, and now to start the Mariner’s Compass. (Jennifer Chiaverini’s ‘Sylvia’s Bridal Sampler” book) Next on my to-do list is start a cotton top for work (to match a skirt I made with my Bernina ruffler foot), and a skirt for my sister-in-law.